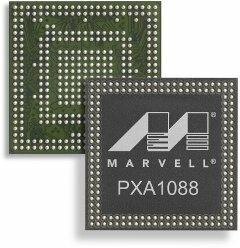 Marvell has just announced the MarvellPXA1088, a quad-core Cortex A7 application and communications mobile SoC that integrates Marvell’s WCDMA and TD-SCDMA modem technology to provide a low-cost 3G platform for both smartphones and tablets. Marvell’s mobile platform also includes Avastar 88W8777 WLAN + Bluetooth 4.0 + FM single-chip SoC, L2000 GNSS Hybrid Location Processor, and an integrated power management and audio codec IC. PXA1088 is said to be pin-to-pin compatible with the earlier PXA988/PXA986 solutions (dual core SoC) so that current mobile device designs can be upgraded with a quad-core SoC without additional development costs. PXA1088 platform is currently sampling with selected customers. Products based on this platform are expected to be available sometimes in 2013. Marvell will showcase PXA1088 at Mobile World Congress, on February 25-28, in Barcelona, Spain.